Here you can find a summary of all my current and former projects. You can also look me up on Github. Swap was released on 25/9/14. If you are looking for someone to play with check out our Facebook fan page here and join our weekly Swapathons! 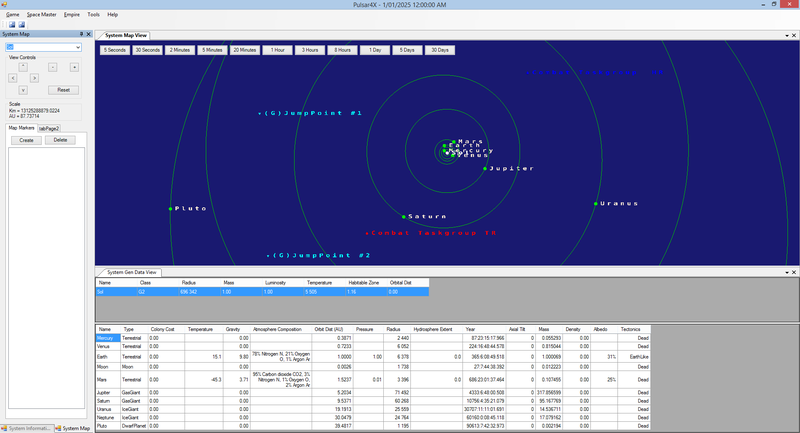 Pulsar4x is a 4x Space Empire strategy/simulation game based on Aurora. The game is still in early development and open source. The game has more in common with a spread sheet then a traditional strategy game, revolving around the various forms you use to manipulate your empire. The game is turned based, where a ‘turn’ is an arbitrary length of time chosen by the users, from 5 seconds to 30 days. It is unique for its complexity (especially in ship design) and excessive amounts of micromanagement, but also very Fun (for a given definition of fun 😉 . I’m a long standing member of the core development team and have contributed to many parts of the game so far, including UI, procedural Star System generation, Game Save/Load and the Core Engine. If you are interested then I suggest you head on over to GitHub and check it out. Chaos – An illustration of chaos theory via a double pendulum. A small game I made with a couple of friends for a game jam. you can play the game here. Use “WASD” to move your character (the little brown guy). Hop in a turret to control it. Press space to hop out of the turret so you can move to a different one. Play Revenge of the Cuddle Buddies! A small app originally designed to emulate a kitchen timer (like this), however it has evolved a little since the original version. You can find the full source code here and download binaries for windows here.